Do you long to know God better? Do you want to understand Scripture more fully? Do you want to pray with power – and see results? 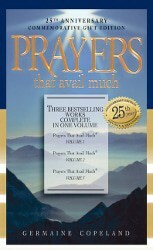 Germaine Copeland’s three bestselling volumes of Prayers That Avail Much have help Christians learn how to pray, to know what to pray and to confidently claim answers to prayer. 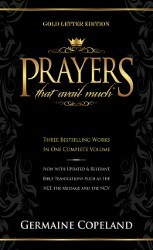 Now this all-in-one edition is your complete guide to praying according to God’s precious Word! Right at your fingertips, you’ll discover dozens of powerful, Scripture-based intercessory prayers for all kinds of life situations, from honoring your marriage to letting go of bitterness, from seeking funding for a ministry to overcoming discouragement. As you meditate on the Scriptures beautifully woven into each prayer, allow them to enter your heart as you speak them aloud. As you put these mighty, scriptural prayers to work in your own life and in the lives of those around you, you will see God moving to perform His Word. You no longer need to feel helpless in the face of difficult or painful situations. You no longer need to miss God’s blessings for you and your loved ones. You can pray with power! I ordered this book in 2006 because my friend recommended it to me. I was praying before but did not see any good changes in my character, or in my life. God knew I needed this book! Until this day I believe that His angel brought it to me. I’ll explain why. I ordered this book and seller’s location is in Texas and my location is in Oregon. This book was shipped by regular Media mail and has arrived in two days! How is it possible? I don’t know. When it arrived, I spent the next 2 hours praying using this book’s prayers and God began moving!!! Now, I understand why my own prayers were not bringing results, because I used MY words, not GOD’S! God knows what we need and left His Word, the Bible to help us live happy, safe, abundant, pleasing Him life. So, when we pray His Word, He hears us and is ready to perform His Word in our life for our good. 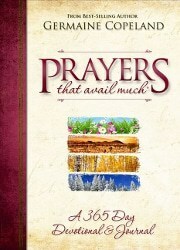 This prayer book is based on God’s Word. I highly recommend it! My all time favorite prayer book. Life, marriage, job, friends, family, etc…. Before you throw it away, give up, or give in…. Pick up this book and read it. Ya, I know! Last thing you want to do is pray for that which has brought you down to this pit you are in. I’ve been there. When I think of miracles… This is one of them. All you have to do is read. God will do the rest. As a friend told me, this book is a road-map to all that you need that’s provided by God’s Word. Jesus says ask and it shall be given unto you and this book tells you how to ask and receive the provision that He has already set aside. Each prayer is heavily cited with Scriptural basis. The prayers put your mind at ease and are practically quite effective–so use them wisely. SPECIAL NOTE:The prayers for a mate might disrupt your current relationships in favor for the one you were destined for. I lost my first book of prayers when I moved in 2009. It was the first Edition, Vol. 1…it was great! When I saw the combined Edition (3 Vols. in 1) I knew I had to have it. This book has spiritual insight and the information in this book will save many SOULS. I suggest anyone that read this review to please buy this book and share it with all of your friends if you care about them. This book explains in detail how to connect with God using His own Words in the Bible. Pray the scriptures it does work. This is definitely a keeper! Very Pleased with my purchase. Germaine writes these prayers so beautifully! God’s word is beautiful! And praying these prayers are just wonderful and so uplifting especially when you feel like you get stuck sometimes and don’t maybe quite know what to pray.